While I don't remember a lot of what my grandma baked throughout the year when I was a child, I vividly recall Christmas being the season when there were massive amounts of cookies and candies being whipped up in her kitchen. And in addition to my favorite, her Pudding Chocolate Chip Cookies, one of the recipes she made each and every year was for Chocolate Covered Cherries. These candies are seriously like nothing you can buy in the store. Once you've eaten them, there is no going back to the boxed variety at the holidays, at least not in my opinion. The taste and juicy inside is indescribable. And I find that I might as well double the batch when they are being made because I'm likely to eat about half of them as soon as they ready. While you'll spend a little time making them because you have to wait for the chocolate to harden, they are not difficult to make at all. The most important thing to remember is that you need a good layer of chocolate inside the mold so that the juice doesn't leak out when you remove them. 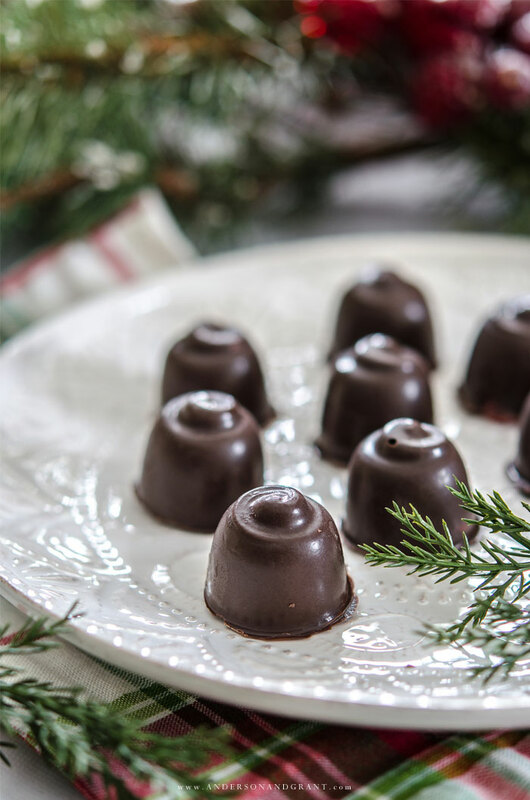 You'll need to purchase a plastic mold designed specifically for making chocolate covered cherries. These can normally be found in craft stores or candy making shops. You can also purchase them online here from Amazon. And in addition to the chocolate and maraschino cherries, you'll also need dry candy fondant powder. It is also available at craft stores, candy making shops, and Amazon. 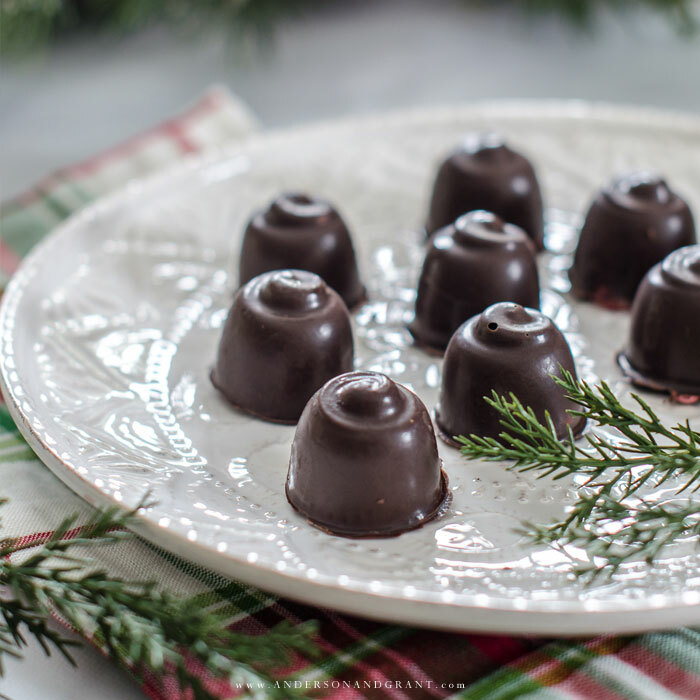 Before we get to our candy making, I want to remind you to be sure to check out the other recipes for Christmas treats that appear at the end of today's post. This is the final week in Ella Claire's Tastes of the Season series that I've enjoyed participating in with some of my blogging friends. There is really something delicious for everyone's tastes buds today! Drain the cherries for at least an hour to overnight on a paper towel lined plate. Reserve the juice from the jar in the refrigerator. To melt the chocolate: Preheat your oven to 190 degrees and then turn it off. 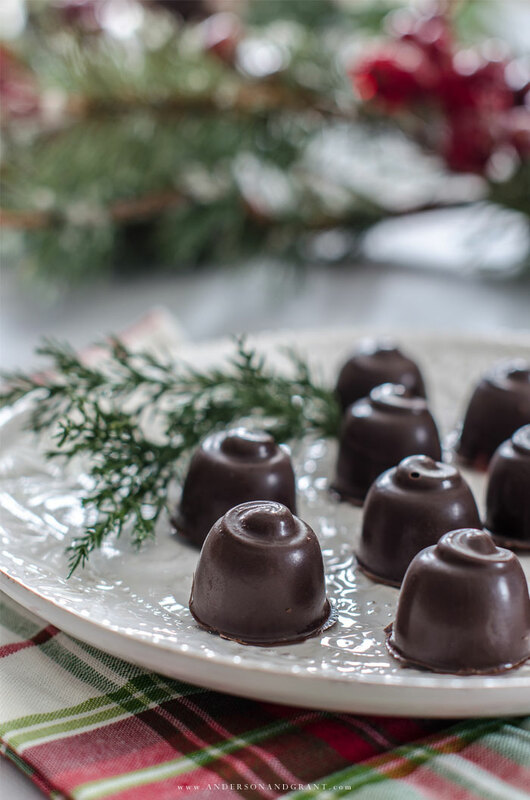 Pour the chocolate candy melts into a glass baking dish and place them into the oven for 20 to 30 minutes. Stir the chocolate occasionally to make sure the chocolate is melting thoroughly. When the chocolate is completely melted, remove the dish from the oven. Dip your finger into the chocolate and thoroughly coat the inside of each individual space in the cherry mold with a layer of chocolate. (You can also use a small paintbrush if you don't like sticking your finger into the warm chocolate.) You need to make sure that there are no spots you haven't coated with chocolate, because the filling will leak out of them. 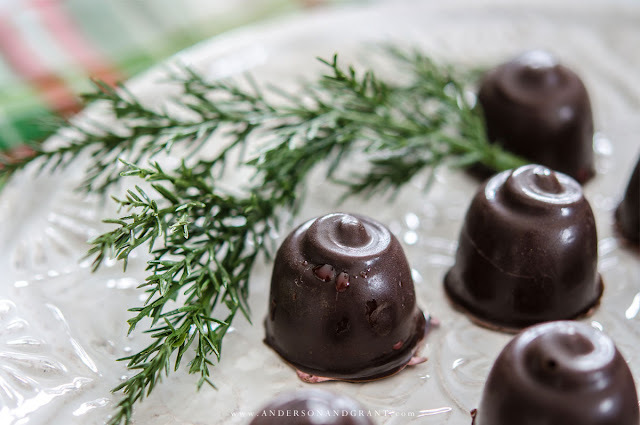 It needs to be thick enough that the chocolate covered cherry will be firm when removed from the mold, but not so thick that there isn't room for the maraschino cherry and filling inside. When all the spaces are filled with chocolate, place the mold into the freezer for 10 to 15 minutes so that it hardens. Put the baking dish of chocolate back into the still-warm oven so that it stays melted. While you are waiting for the chocolate to harden, mix 3/4 cup dry candy fondant powder with 4 Tablespoons of the reserved cherry juice. If it seems too thick, add more juice 1 teaspoon at a time. It should be liquid enough that you can pour it from your spoon into the spaces in the mold. 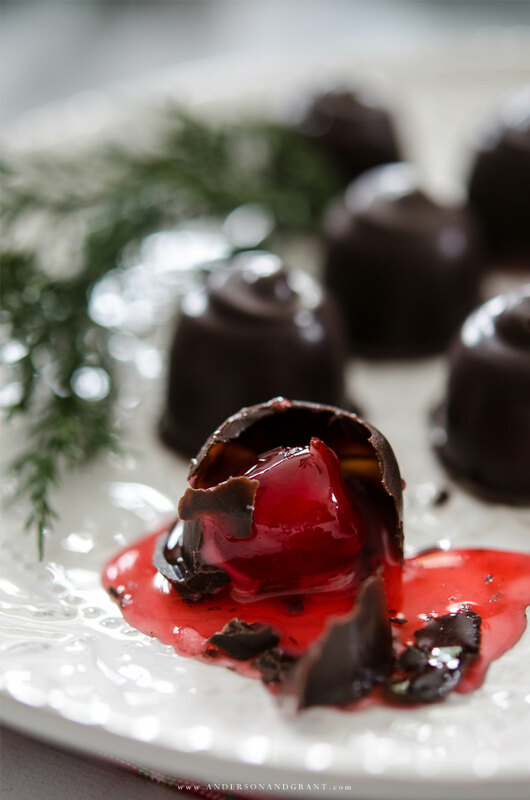 Remove the mold from the freezer and place a maraschino cherry in each space being sure that the top of the cherry does not rise above the top edge of each individual space. Gently press it down into the space if it does. Then fill almost to the top of each space with the cherry fondant you mixed. Place the mold back into the freezer for 10 minutes. Take the mold back out of the freezer and the chocolate out of the oven. Spoon chocolate over the top of each space being sure to completely cover the cherry and fondant filling and seal the edges. Place the mold back into the freezer one final time to harden. After 15 minutes, remove the mold from the freezer and turn it over on a piece of waxed paper. 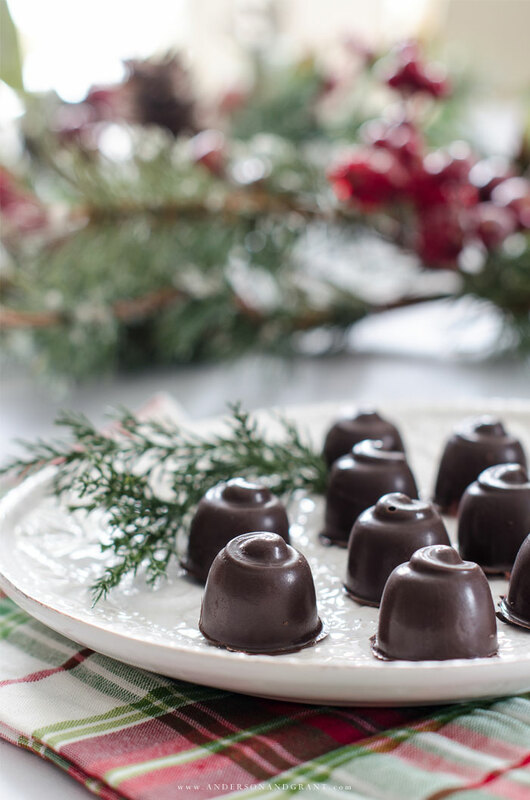 If the chocolate covered cherries do not come out easily, lightly tap the mold on the counter top to release them. Store the cherries in a tightly sealed container or tin. They will last for a few weeks and actually get better as they age. I hope that this is a recipe you'll make year after year just like my grandma did. They are a nice treat to pop in your mouth as you walk through the kitchen, and can also be packaged beautifully to give as a simple gift to someone you want to remember this holiday season.